Mandan is associated with four of the thirty-one men who have served as Governor of North Dakota; one started his career here (William Langer); one was born here (George Schafer); one died here (Joseph Devine) and one who moved here. On September 15, 1858, Frank Arlington Briggs was the third of four children and the only son born to Sarah D. (Devoll) & Thomas Rice Briggs in Hennepin County, Minnesota. Both parents were from Rhode Island. His father was a prosperous carpenter, to a point Frank grew up among the advantages of domestic servants. His sisters included Sarah, Emily and Kate. Briggs was educated in Minnesota. He worked as a printer and newspaper editor before coming to North Dakota and was prosperous enough to also engage domestic servants for his family. He and his wife, the former Nannie R. Meek (b. July 1858), were married on July 12, 1877 in Howard Lake, Minnesota. They moved to Mandan in 1881 where Briggs found work as a bookkeeper. He went on to work in real estate and eventually received the appointment as postmaster for Mandan. He was elected as Morton County's treasurer in 1886 and served eight years. Briggs was also honored by the Masonic Lodge of North Dakota by being elected its Grand Treasurer in June 1891. Briggs was elected to his first state-wide political office as North Dakota State Auditor in 1894. He had lobbied hard the Republician party to be renominated for the auditor's office, but was drafted to run for governor. In 1896, Frank Briggs was elected the fifth Governor of North Dakota on the Republican ticket and succeeded Governor Roger Allin. He understood the financial resources of the State and with his prior business and State Auditor experience, he was well prepared to administer its affairs. During Briggs' administration, a general railway law was passed that regulated the transportation of passengers and freight. A general revenue law was also passed. Many of its provisions had been suggested by Briggs. During Briggs' brief tenure as governor, the North Dakota National Guard emerged as an experienced fighting force, and distiguished itself in the Philippine Insurrection. In the 19th century, the nation's military practice allowed for two typed of armies. The first was the regular army which existed for peacetime duties. During times of war, this army would be supplemented with volunteer citizen soldiers. Without a strong central War Department, States bore the responsibility of raising this volunteer army in times of crisis. Civilians would often organize companies of their own as in the Civil War. Governors could accept these ambitious volunteers, especially if they were politically or socially prominent. These "military entrepreneaurs" would be given a commission and go on to lead their followers to war. On February 15, 1898, the battleship USS Maine exploded while moored in Havana, Cuba's harbor. Tensions had been building for months. Citing the Monroe Doctrine of 1823 and working to eliminate European influence in the western hemisphere, Congress demanded Cuba be granted independance on April 19. Spain reciprocated by declaring war on the US on April 23. The Spanish-American War had begun. Even before Congress passed mobilization legislation, Governor Briggs received requests from various individuals for commissions so that they may begin recruiting. The US War Department established Camp Briggs outside of Fargo as the muster point for the 1st North Dakota Volunteer Infantry. While most of the main forces of the US Army were engaged in Cuba, the ND state militia was assigned to the Phillippine Island Expeditionary Force. 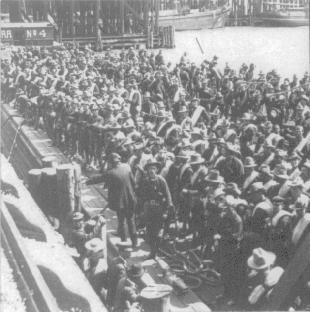 On June 28, the regiment departed for Manila. While the Spanish-American War would end just months later, some in the Philippine Islands did not accept the terms of the surrender and sought indepandance for themselves. The United States fought in a new engagment, known as the Philippine Insurrection, until 1899. Ten North Dakotans, including Mandan resident Richard Longfellow and former resident Frank Anders, distingushed themselves in battle and would eventually receive the Congressional Medal of Honor. Frank Briggs died of tuberculosis on August 9, 1898 less than two years after his election. His unexpired term was completed by Lt. Governor Joseph M. Devine. Funeral services were provided by Mandan's Masonic Temple and held at the Governor's residence. Newspapers extolled his virtures for days after his death and was universally admired throughout the state. Governor Frank and Nannie Briggs were the parents of 2 daughters Stella (b. April 1878) and Bessie (b. June 1880). Nannie relocated to Tacoma City, WA after the death of her husband and moved in with her younger sister and brother-in-law Charles E. and Carrie E. (Meek) Smith. Her mother Nancy Pearson and youngest brother Westley also resided there at the time. He was the first ND Governor to die in office. Frank Arlington Briggs is buried in the family plot in Howard Lake Cemetery, Howard Lake, Minnesota. Information on Governor Briggs' involvement on the establishment of the 1st North Dakota Volunteer Infantry Regiment was based on an article by Major Peter W. Conlin in the October 1999 100th Anniversary Special Edition of the North Dakota's National Guard's newsletter The Straight Arrow.